The Nikon D7200 is a powerful dSLR, providing excellent image quality and good performance. Offering more than an entry-level camera, it is worth the extra money if you are looking for the higher quality images and performance. Read more in our Full Conclusion. The Nikon D7200 is a new mid-level, DX-format (APS-C sized image sensor) DSLR that boasts a 24.2-megapixel CMOS sensor with no optical low-pass filter (OLPF) and the EXPEED 4 image processing system. With a wide 100-25,600 ISO range, you can shoot stills or Full 1080p HD videos with minimal noise, even in marginal lighting conditions. 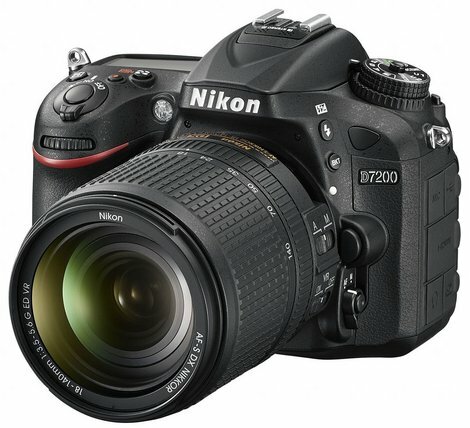 The D7200 also includes two new Picture Controls (Flat and Clarity) as well as built-in Wi-Fi and NFC (Near Field Communication) technologies which - using Nikon's Snapbridge experience - connect the D7200 to compatible smartphones and tablets where you an do everything from transfer images, share them online, or even remotely control the camera; effectively making your smartphone an external display. Full 1080p HD Videos can be recorded at 30, 25, or 24 fps, while you can extend that to 60 or 50 fps in 1.3x crop mode. The D7200 is also capable of recording stereo sound (with 20 step adjustments), and offers Auto ISO for smoother transitions between lighting conditions, Zebra Stripes to avoid over exposing video, and a Time Lapse Mode for creating, you guessed it, Time Lapses. The Nikon D7200 DSLR is available as a body-only - for $1,199.95 -- or a kit that includes an AF-S DX NIKKOR 18-140mm f/3.5-5.6G ED VR for $1,699.95.See our best price box at the top right of this page to see current online pricing.